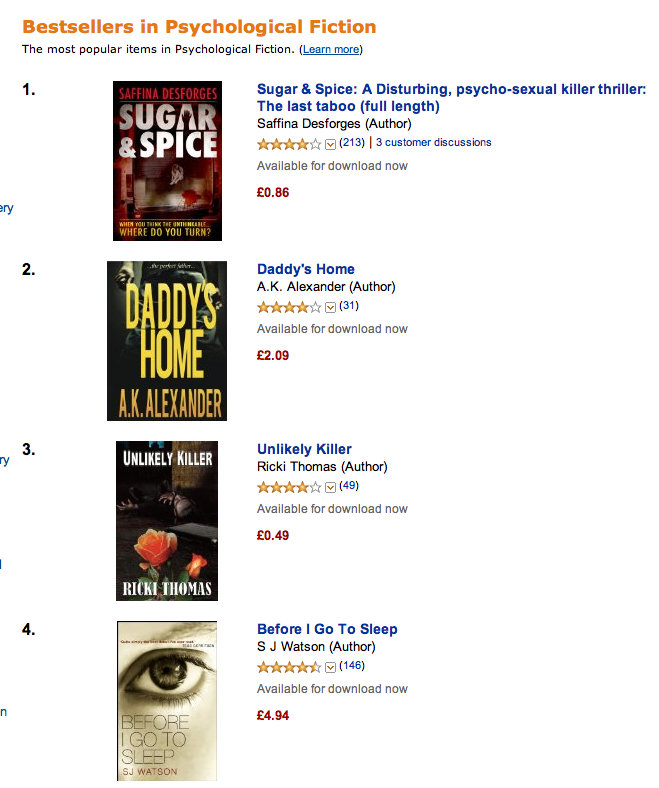 Sugar & Spice hits #1 – again! Well, after 175 days in the Top 100 in the UK Amazon paid store and a few days before the release of Snow White, we certainly didn’t expect another number one! The Amazon charts are crazy at the moment with trad pub’d works on sale, but we seem to be holding steady in the Top 100 and ‘Sugar & Spice‘ is still selling thousands a month, so we are very happy to still be the only ‘truly indie’ book that reached #2 in the charts and has sold the most copies of a debut novel. I have told all my pals about this book but most have not bought kindles as yet. Is there no chance of a paper publish? You are such a fresh writer it would be good to be able to discuss your work. How awesome is that?! Big Six publishers would never let a book stick around long enough to get to #1 twice.